Humans may have big, bulbous brains, but when it comes to pure muscle power, we’re often considered the weakest of the great apes. Even chimpanzees, who are significantly smaller than us, exhibit levels of strength that are practically super-human by our standards. New research shows the degree to which our primate cousins are stronger than us—and why their tiny bodies pack such an impressive punch. Pound-for-pound, chimpanzees are 1.5 times stronger than humans at pulling and jumping tasks, according to new research published today in Proceedings of the National Academy of Sciences. This strength is not the result of the chimpanzee’s physical form, its range of motion, or a newly-discovered dedication to bench presses and deadlifts, but instead, the product of how the fibres in chimp muscles are distributed. Because chimpanzees are our closest-living primate relative, these findings are offering new insights into human evolution—and why’re we’re such weaklings. Scientists have known about chimpanzee strength for quite some time now, documenting feats of “super strength” in both wild and captive chimps. Researchers have used pulling and jumping experiments to compare chimpanzee and human muscle strength since the 1920s, but they’ve struggled to understand the physiological and mechanical reasons behind the observed differences. As to why they’re so strong, that’s an easier question to answer. Their extra strength makes sense from an evolutionary perspective; chimps are adapted to forest life, climbing trees and living among the branches. Humans, on the other hand, abandoned the forest a long time ago—a change of setting that required a different set of physical and cognitive adaptations. Over time, we’ve become less reliant on muscular strength for our survival, while chimps have retained their tree-climbing, branch-swinging strength. In 2014, researchers discovered that chimp muscle feature unique properties that affect their power-producing capabilities. The new PNAS study, led by Matthew O’Neill from the University of Arizona, piggybacks off this prior research, taking a closer look the actual biology and mechanics of chimpanzee muscle tissue, and comparing muscle strength in humans and chimps. “Our work is the first detailed study of the biology and mechanics of chimpanzee muscle tissue,” O’Neill told Gizmodo. “Our results show that the main difference between chimpanzee and human muscle is in fibre distribution, with chimpanzees having a much higher fraction of fast fibres than humans, on average,” adding that “all of our measurements of chimpanzee muscle are new.” For the study, muscle fibres were sampled from three young male chimps. In addition to reviewing the research done in this area between 1944 and 2014, the researchers used computational modelling and a simulation to determine the effect of fibre distribution on the chimps’ various muscles. “The modelling-simulation piece allowed us to set up computational experiments that mimicked how a muscle in the leg or arm would behave during a maximum jump and or pull,” said O’Neill. Analysis of the previous experimental studies showed that chimps, on average, outperform humans by a factor of approximately 1.5 in pulling and jumping tasks. The computer models, which combined the experimental data with the simulations, showed that the maximum force and power output of chimp muscles is 1.35 times higher in chimps than human muscles of similar size. This is primarily due to the chimp’s higher fast-twitch fibre content, which enables high force and power, but lower endurance. 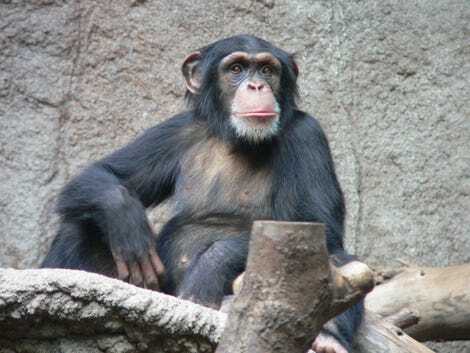 Chimpanzee muscle is composed of approximately 67 percent fast-twitch fibres, compared to about 40 percent in humans. In other words, chimps can pull more stuff and jump with more power than humans once our differences in size are accounted for (a typical adult chimp weighs about 100 pounds). These physical differences emerged over the course of the past seven to eight million years, as humans migrated away from forests and towards bipedal life on the ground. The resultant losses in maximum force and power output were offset by gains in endurance and the ability to perform repetitious, low-energy movements (such as fashioning stones into tools). What’s more, as hominins transitioned into a hunter-gatherer mode of existence, selectional pressures for cognitive skills emerged, resulting in bigger brains and a decreased reliance on physical strength.